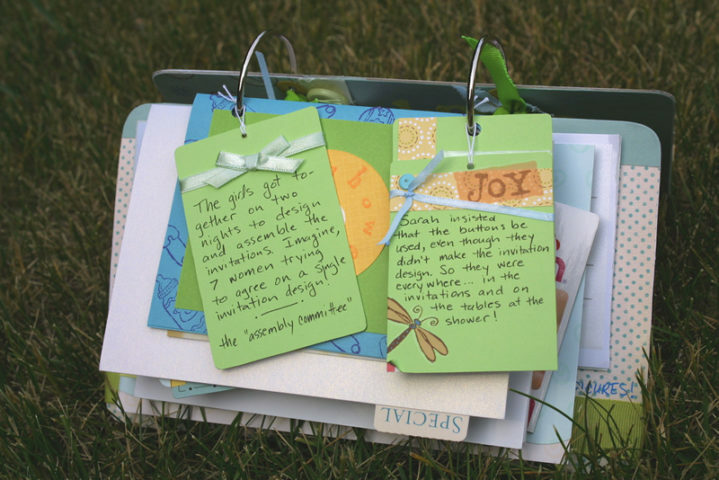 Some scrapbookers find journaling one of the hardest parts about scrapbooking — whether it’s finding a snappy title for the page or writing up a description for the event that’s depicted in a photo. But journaling adds so much to the value of the scrapbook page that it shouldn’t be overlooked. Here are some easy ways to find creative words and phrases for your scrapbook page titles and photo captions. Experienced scrapbookers collect bits of useful text, just like stamp collectors collect stamps. One of your best tools for documenting all of your ideas is a simple notebook and pen where you can jot down ideas as they come to you — no matter where you are. TIP: Later, I transfer all of the ideas I’ve collected into a freebie computer program — organized by keyword, category, or tag. But that part is optional. More on that in a minute. Keep your Scrapbook Idea Notebook with you when you have to spend some time waiting — such as during a visit to the doctor, when you’re taking a coffee break at work, when you’re stopped in traffic during your commute, you get the idea. Keep your eyes and ears open — at all times — because you never know when something’s going to “click” with a page that you’ll be creating in your scrapbook! Often a snippet of an overheard conversation or a sign in a window will give you a great idea for a scrapbook page title or a whimsical phrase to use in a photo description. Any materials that pass through your hands — like magazines, newsletters, brochures, newspapers — should be viewed as scrapbook resources. Whether they’re your own, or you’re browsing through items available to you in a waiting room or at a friend’s house… you should always flip through them with a scrapbooker’s eye — in search of catchy titles and fun ways to say things. When you’re on the Internet, look up quotation sites. If you can’t think of anything to say yourself, chances are that someone has already said it — and better than you can anyway. So take advantage of that. An obvious place to find great journaling phrases online is scrapbooking websites. Whether you’re viewing the page layouts of others, or browsing stickers and embellishments for a variety of page themes, at the same time, you should also be surfing for scrapbook-worthy sayings. Don’t overlook your favorite songs and poems — sometimes songs say it best! A special song lyric can not only give you a ready-made title for a page, but also a whole theme for a scrapbook layout. For example, the songs of John Lennon, Bob Dylan, and Madonna are fruitful grounds for gathering ideas. How about a page on your childhood titled This Used To Be My Playground? The lyrics are from Madonna’s movie A League of Their Own, but the nostalgic quality can apply to anyone’s life. The secret to your journaling success lies in your ability to organize all of the ideas you’ve picked up here & there and saved for future reference. That way, when you need a related phrase or title, you know where to find it… fast! If you think your handwriting isn’t up to par, don’t worry about it. Do your best, or print the information. No one really cares how it “looks” — the words are what people appreciate the most. As you know, the personal touch in scrapbooking is what’s important, and your handwriting is as much a part of you as how you place the embellishments and what papers you choose, so you should try to use your own handwriting whenever possible. But if this particular scrapbook album is for a special occasion (like a wedding), you can always print out the journaling from your computer, choosing a suitable font and paper (such as script font on vellum paper). Trust me, even if you’re not a writer by nature and don’t have a way with words, you can still do a decent job of journaling on your scrapbook pages with this simple tip. How? Simply answer these 5 questions — in every photo caption you write. In sum, you want to make sure that your journaling includes the identities of the people in the pictures, what was happening at the time, the setting, the date of the event, and why it is important to you. These are the very same questions future generations will be asking, the same questions you ask when you come across an unidentified old photograph, and the same questions you would ask if you were looking at someone else’s scrapbook.